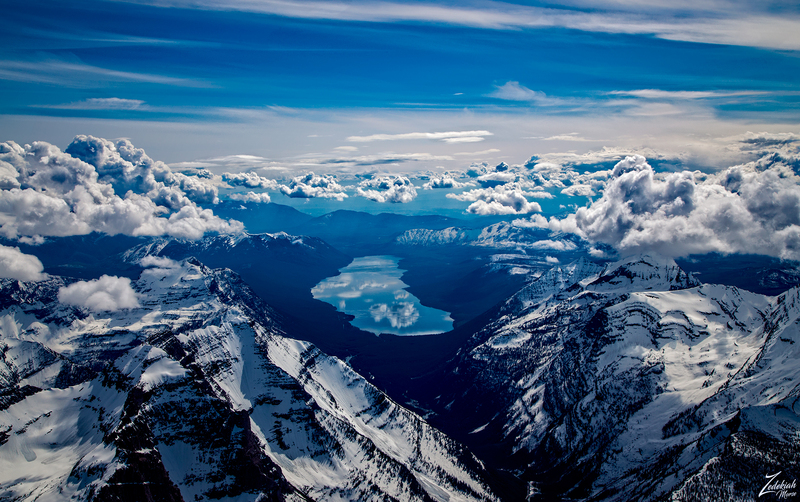 In this image of Lake McDonald taken while flying above Haystack Butte, the Glacier Wall is on the immediate right and Mount Cannon is on the left. At the western end of the lake in the distance lay the Apgar Mountains. Lake McDonald is known by the First Nations Ktunaxa (a.k.a. Kootenai) Tribes People as Ya-kit Haqwilnamki (The Place Where They Dance). This is their traditional place of creation, the location where many years ago a spirit first taught the Kootenai people songs and circle dances. This is the place where the spirit gave them their wisdom to use in guiding their lives down the correct path. This is also where the tribes all returned every winter to begin anew, the next yearly cycle of their lives. This was a sacred place to the ancient peoples who lived in these lands so long ago, this was a place for dancing and a place for vision quests. Since time immemorial, the First Nations Kootenai people had returned to the lake to dance and sing songs as was their tradition. Here, they received help and guidance from different spirits. Steam from the moisture in the air reacting to the early morning heat drapes a beautiful cloak of soft mist across the Rocky Mountains and Lake McDonald in Glacier National Park. Lake McDonald is on the bottom left of the image and from left to right along the mountain skyline are Stanton Mountain (7750 ft / 2362 m), Mount Brown (8565 ft / 2611 m), Edwards Mountain (9072 ft / 2765 m), Gunsight Mountain (9258 ft / 2822 m) with Sperry Glacier and finally on the far right lies Mount Jackson (10052 ft / 3064 m). 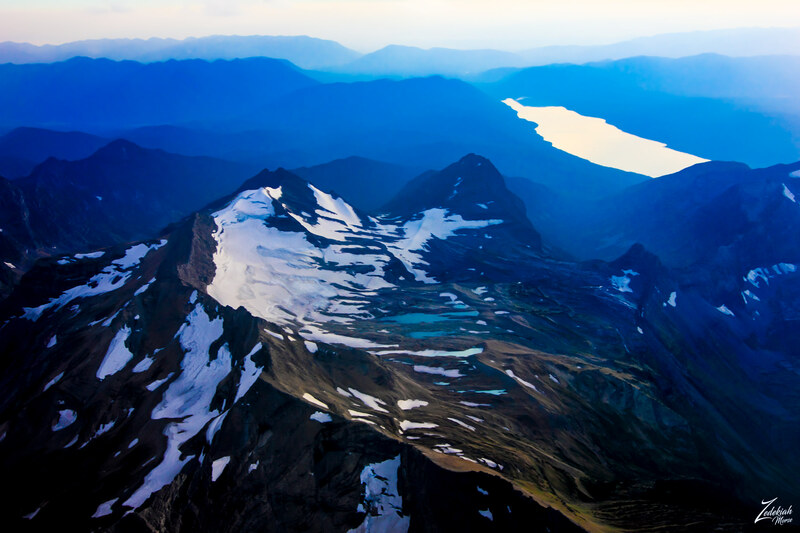 In the image below, Gunsight Mountain, with Sperry Glacier nested on its crown sits high above Lake McDonald, shining in the late afternoon sunlight down in the valley below. Recent archaeological surveys have found evidence of human use dating back over 10,000 years. These people were probably the ancestors of tribes that live in the area today. By the time the first European explorers came to this region, several different tribes inhabited the area. The First Nations Blackfoot Tribes controlled the vast prairies east of the mountains. The Salish and Kootenai Indians lived and hunted in the western valleys, the ones you see in this image. The Blackfoot called those mountains on the horizon the “Backbone of the World” and the “Shinning Mountains”. In the image above, after a strong autumn rainstorm, Lake McDonald glows with mist which rises and lays on the hills above the lake, creating what is locally called “Ghost Clouds”. 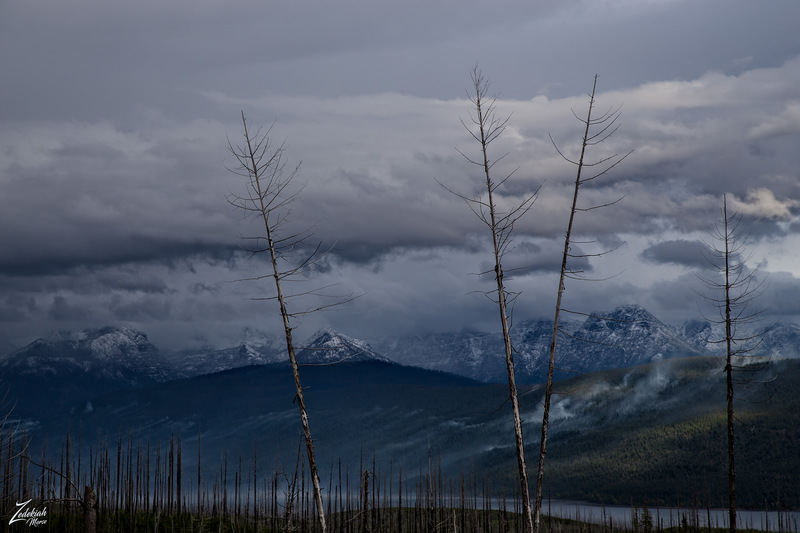 In the immediate foreground are the remains of a forest fire which ravaged this hill and in the distance are the mountains of Glacier National Park including Gunsight Mountain, Little Matterhorn, Glacier Basin and Lincoln Peak. In the image above, taken from the exact spot where these dances took place, the serenity of Lake McDonald reflects the majesty of the Rocky Mountains in Glacier National Park. On the left of the lake is “Howe Ridge”, peeking up from behind Howe Ridge is “Rogers Peak”, part of the “Livingston Ridge”. Further to the right that first large peak in the middle of the image, is called “Heavens Peak”. Way off in the distance peeking out from behind the mountains is the geological formation known as “The Garden Wall”. to the right of that large peak in the middle is “Cannon Mountain”, then “Bearhat Mountain” and that tall slender peak to the right is the “Little Matterhorn”. And finally to the far right is “Edwards Mountain” and then “Snyder Ridge”. In this image above Lake McDonald serenely reflects the mountains of the Livingston Range while golden amber hues of alpenglow bathe the sky in a warm glow all down the long North Fork Valley.